Harvest 2017 is quickly coming upon us. The change of seasons, brilliant colors, the cool, clean air with morning fog over the lakes gives one such serene feelings - the calm before the busiest time of the year at the wineries. Tourism picks up as visitors delight in watching activities in the vineyards and feeling part of the coming vintage. 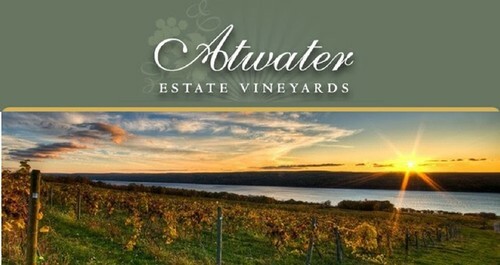 On that note, we've learned that Atwater is a semi-finalist for Upstate New York's Best Winery Of The Year! If you would like to VOTE for your favorite winery click on the check box next to the name. You can select up to two places, but can only vote one time. The poll will close 11:59 p.m. on Sunday, Sept. 17. We have many wines that are perfect for the fall weather but one that really stands out with autumn's seasonal foods is our Gewürztraminer. Highly aromatic and slightly spicy, not only is it a perfect compliment for that sage-rubbed turkey with all the fixings, but the viscous, silky mouthfeel and richness will beautifully complement herb-scented gravy, butternut squash soup, oyster stew, or curried mussels. This dry (.4% RS) style has floral aromas and flavors of honeysuckle, spicy gingerbread and grapefruit. Gewürz begs to be paired with food and it’s pairings are numerous. Good with all forms of pork, spicy grilled chicken, Asian cuisine. We are now offering low shipping prices on ALL wines where we are legal to ship. Simply purchase 4 or more bottles and shipping will cost $1 per bottle. No promo code will be necessary and you can use this discount at anytime during the month of September. Browse our wineshop - the savings will really add up and we are happy to share them with you.